Characters can climb up to level 50, after which they'll be reset to level 1 (without losing any unlocked gear) and awarded an “Echelon” rank. There are ten echelon ranks to earn, which means an awful lot of room for advancement and unlocking before the ceiling is hit. On the customization side of things, Doom will offer nearly 300 pieces of armor divided into five themes—UAC, Demonic, Bounty Hunter, Templar, and Utilitarian—which can be tarted up with 50 different paint patterns. Weapons can be customized in a very similar fashion, with 96 colors, 60 patterns, and adjustable weathering. Players will also be able to employ multi-tiered “Hack Modules” that offer small advantages in combat, like temporary infinite ammo or an alarm that goes off when an enemy is nearby, and carry equipment ranging from conventional frag grenades to Shield Walls that can be used to block movement and gunfire. And there are taunts—many, many taunts—which can get you (hilariously) killed if you unleash one at an inopportune time. Of course, all the equipment in the world won't do you a bit of good without some big guns to wave around. Fortunately, we already took a look at (and cast judgment on) the full Doom arsenal, which you can dig into here. 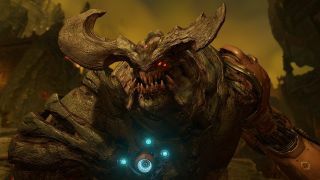 The Doom multiplayer open beta goes live at 12:00 am on April 15.